CLAREMONT — Every other Tuesday, a van stocked with laptops, swivel chairs and wireless Internet pulls up to the Morris Houses in the South Bronx, where, for a few hours at least, the digital divide grows a little smaller. The mobile computer lab, one of two that the city Housing Authority has operated since February, allows public housing residents with limited Internet access to surf the Web, print résumés or type book reports, all within steps of the buildings where they live. When Bilkisu El-Yakub, 35, first spotted the van parked outside the Morris Houses on Third Avenue, she asked a staff member if it was like an Internet café. He said it was. Then she asked the cost. Free, he replied. 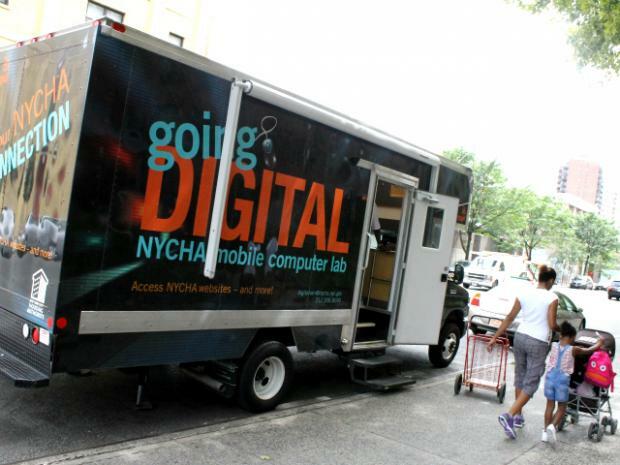 The air-conditioned vehicles, which NYCHA calls Digital Vans, are outfitted with eight laptops each and wireless Internet, which tenants can also access outside the vans on their own devices. Trained instructors travel with the vans to problem solve or, in some cases, to explain computer basics. The vans shuttle daily between 19 NYCHA developments across the city, including 10 sites in The Bronx, stopping at each development about once every two weeks. They are partly funded by a federal Broadband Technology Opportunities Program grant. The roaming computer labs are part of the city’s effort to plug-in its public housing residents at a time when tech skills are fast becoming a prerequisite for work and everything from homework assignments to medical records are moving online. “My job is to try to close the digital divide,” said Atefeh Riazi, NYCHA’s chief information officer and acting general manager. Nearly four in 10 NYCHA residents have no Internet access in their apartments, Riazi said. Most cannot afford the cost of broadband Internet, though some choose not to subscribe to it, she added. High-speed Internet access at home tracks closely to income — families that have less money tend to have less access to the Internet. About 40 percent of US families earning less than $25,000 a year used broadband Internet at home in 2010, compared to about 80 percent of families earning $75,000 or more, according to Department of Commerce data. The average family income of NYCHA’s residents is $23,000, Riazi said. Some people without broadband at home still log on to the Internet with their cell phones. But many experts say phones provide a poor substitute for the array of activities, such as in-depth research or word processing, which are possible on a computer. “I’ve never seen a seven-year-old do homework on a cellphone,” Riazi said. Pamela Swann, 48, who lives in the Morris Houses with her mother, normally walks to the nearest library to use the Internet to complete assignments for the technical college where she studies medical billing. But the crowds and the computer time limits at the library often make it hard for her to finish her schoolwork. So on Tuesday, she left her grocery cart on the sidewalk and climbed aboard the Digital Van, where she read her email and attacked her homework. “A lot of people don’t have computers,” he said. “And many of those that do, don’t know how to use them,” he added, recalling times he saw computer novices learn the basics from a Digital Van instructor. But at 4 p.m., it was time for Gittens and Swann, as well as a couple kids playing racing games and checking Facebook, to log off and leave the van.